Brenda L. Croft, ‘shut/mouth/scream’ (detail), 2016. Source. Damion Searls on how psychiatrists used Rorschach tests to examine Nazis during the Nuremberg trials. George Monbiot’s piece on being ‘Screened Out’. Julian Cribb on why ‘coal will kill more people than WWII’. Frank Brennan, Tim Costello, Robert Manne, and John Menadue reckon that ‘we can stop the boats and also act decently, fairly and transparently’. The announcement about the National Gallery of Australia’s ‘Defying Empire: 3rd National Indigenous Art Triennial’ coming up later this year! Chris Green’s Ash Wednesday reflection – Christ’s Death Lives in Us. Steve Wright’s Ash Wednesday reflection – To dust. Mary Beard is simply awesome: check out her piece on Seneca and her lecture on women in power, delivered at the BM. For those within cooee of Melbourne, this looks good – Thomas Crow, Anne Dunlop, and Charles Green talking about theological originality in art. Matthew Sharpe on Montaigne’s Essays. Jane Hutcheon talks to Reg Mombassa. Michael Hobbes on the epidemic of gay loneliness. Jonathan Sacks on the architecture of holiness. Rick Floyd has been looking for light in the shadow of death. Jason Guriel on Christian Wiman and ‘kind of faith that a poet had better not lose’. Queensland, a part of the country where most locals seem to espouse the philosophy that two wongs don’t make a white and which is not especially well known for a radical brand of Christianity, sees some religious fanatics charged for beating swords into garden hoes. A funeral homily by Kim Fabricius, plus his good little introduction to Christianity. Raimond Gaita on Donald Trump’s America. John Milbank on the problem of populism and the promise of a Christian politics. The University of Divinity is seeking a Director for its Centre for Research in Religion and Social Policy (RASP). Why students hate peer review, and how to make it work better for them. Watching Umberto Eco and his books and books and books and paintings and books and books and ladders means that I will tolerate no more complaints on this subject, from anyone. Speaking of no complaints, Doug Gay’s third public lecture on reforming Scottish Presbyterianism is now available here. ‘The church expresses a corporate existence where divine agency interacts with human affairs, and such an interaction nurtures, that is to say gives life and shape to, the ecclesial body … [A] theopolitics of Christ’s Body in the Eucharist is rooted not exclusively in power, but, in a more primary sense, in divine caritas, which is expressed with a radical gesture of kenosis, reciprocity, and concrete communal practices. This is not to say that power is herein dismissed, or that the Eucharist is a sign of disempowerment. There is a politics of power here. Yet it is a power that integrates plenitude of desire; it is the paradoxical force of sacrifice on the cross; it is the humble power of bread broken into pieces for the purpose of sharing; it is the washing of feet that means a life of service to one another; it is the power of giving one’s life for the other. In other words, this is the theopolitical power of caritas, where the extraordinary embraces and transfigures the ordinary: God’s “sovereignty disclosed at the breaking of the bread,” as Samuel Wells remarks’. 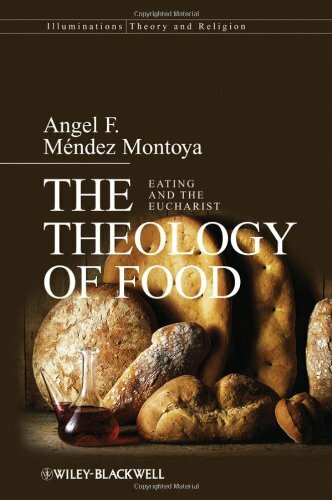 – Angel F. Méndez Montoya, The Theology of Food: Eating and the Eucharist (Chichester: Wiley-Blackwell, 2009), 115–6. Of one being with the Economy. From this, all value is added. The only way to prosperity. To take away our economic sins. But rose again, in accordance with their manifestos. And are seated at the right hand of Milton Friedman. The giver of economic life. It has spoken through our profits. And with the Market is worshipped and glorified. We believe in one Globalised Economy. For the increase in Gross Domestic Product. For the measurement of wealth. And the life of the financial years to come.